North Dakota State’s chapter of Delta Tau Delta-Iota Sigma is hosting Deltaween this week. All proceeds generated from the events will benefit the chapter’s national philanthropic venture, the Juvenile Diabetes Research Foundation. Deltaween will be kicked off with a pumpkin carving contest campus organizations can participate in as well as Deltaroni, a macaroni and cheese feed. Public attendees will vote for the winner of the contest, who will win 10 percent of the proceeds from Deltaroni to donate to the organization of their choice. Along with mac and cheese, breadsticks from Olive Garden and desserts from The Shack will be served. Cost for the meal is $5 per person. The event takes place from 5:00 p.m. to 8:30 p.m. at the University Lutheran Center. At 6:00 p.m. a speaker from JDRF will give a presentation to increase awareness of living with type one diabetes. The fraternity will host a bake sale at 10:00 a.m. until 2:00 p.m. in Memorial Union. A dunk tank will be activated at noon in Sheppard’s Arena. Active members of the fraternity, presidents of other Greek houses and Renee DuBois, Greek adviser for NDSU, have volunteered as tribute. 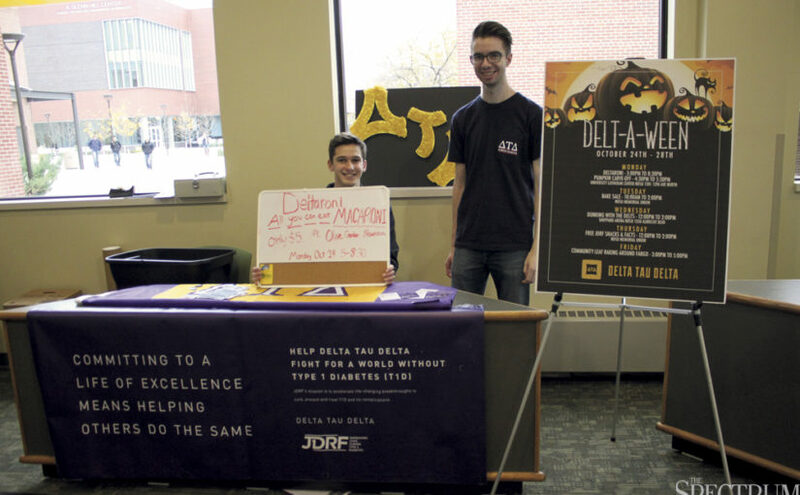 The fraternity will provide free snacks and water, as well as flyers with information about JDRF in MU from 12:00 p.m. to 2:00 p.m.
Deltaween will conclude with a campus-wide community leaf raking event. All are invited to participate, provided they bring their own rake. Participants will knock on doors offering to rake residents’ leaves, free of charge. Those who wish to attend are asked to meet in the Memorial Union Parking lot at 3 p.m.
DTD president, Khang Tao, said JDRF is an organization that has a dual role to help families affected by type one diabetes as well as to support research find a cure for the disease. “All proceeds will go to JDRF for them to continue the great work they do,” Tao said. JDRF’s mission is to create a world without type one diabetes.